Burger Buns are easy to make and delicious with grilled hamburger and other meats. Makes great hot dog buns, too! Have water and milk at 80°F and all others at room temperature. Place ingredients in pan in order recommended by bread machine manufacturer. Select dough/manual cycle. Check dough consistency after 5 minutes of kneading. The dough should be in a soft, tacky ball. If it is dry and stiff, add water, ½ to 1 tablespoon at a time. If it is too wet and sticky, add 1 tablespoon of flour at a time. At end of cycle, remove dough; follow Shaping, Rising and Baking instructions below. See our Bread Machine section for more helpful tips and information. Dry mixture: Combine 1 cup flour, yeast, salt and sugar; set aside. Liquids: In a microwave-safe bowl/cup, heat water and milk to 120° to 130°F. Hand-Held Mixer Method: Combine dry mixture, warm milk & water and oil in mixing bowl on low speed. Beat 2 to 3 minutes on medium speed. Add egg; beat 1 minute. By hand, stir in enough remaining flour to make a firm dough. Knead on floured surface 5 to 7 minutes or until smooth and elastic. Use additional flour if necessary. Place dough in lightly oiled bowl and turn to grease top. Cover; let rise until dough tests ripe, about 60-90 minutes. Continue with Shaping, Rising and Baking instructions below. Stand Mixer Method: Combine dry mixture, warm milk & water and oil in mixing bowl with paddle or beaters for 4 minutes on medium speed. Add egg; beat 1 minute. Gradually add remaining flour and knead with dough hook(s) 5 to 7 minutes until smooth and elastic. Place dough in lightly oiled bowl and turn to grease top. Cover; let rise until dough tests ripe, about 60-90 minutes. Continue with Shaping, Rising and Baking instructions below. Have all ingredients at room temperature. Put dry mixture in processing bowl with steel blade. While motor is running, add egg, milk, water and oil. Process until mixed. Continue processing, adding remaining flour until dough forms a ball.Place dough in lightly oiled bowl and turn to grease top. Cover; let rise until dough tests ripe, about 60-90 minutes. Continue with Shaping, Rising and Baking instructions below. Turn dough onto lightly floured surface; punch down to remove air bubbles. Divide into two equal pieces. Divide each half into 3 or 4 pieces. * Shape each piece into a smooth ball. Place on large greased baking pan. Flatten each ball to a 4-inch diameter, allowing one inch between buns. Cover; let rise until indentation remains after touching, about 20 minutes. For egg wash: whisk together egg and water; brush on buns. 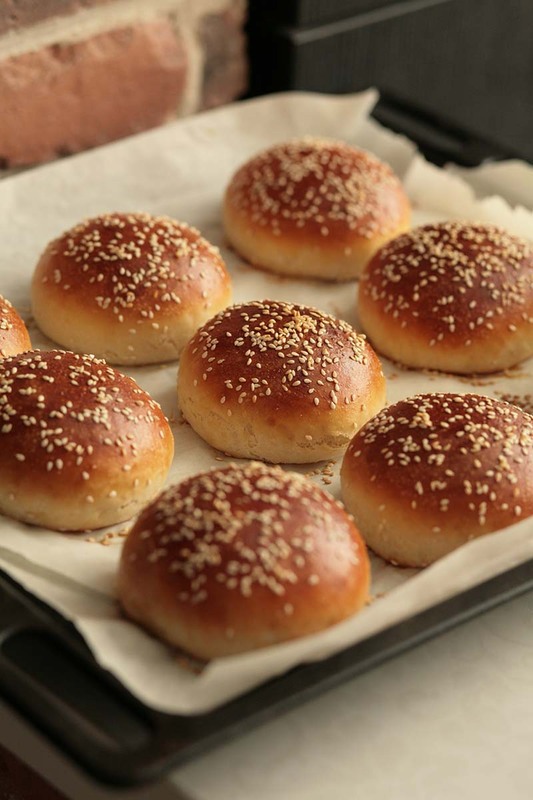 Sprinkle buns with sesame seeds (optional). Bake in preheated 400°F oven for 10 to 12 minutes. Remove from baking pan and let cool on wire rack. *Hot Dog Variation: Shape each piece into a 6x4-inch rectangle. Starting with longer side, roll up tightly, pressing dough into roll with each turn. Pinch edges and ends to seal. Place on greased baking pan. Let rise and bake as directed above. You can substitute Instant (fast-rising) yeast for Active Dry Yeast. Traditional methods- replace 1:1. Expect your dough to rise faster; always let your dough rise until ‘ ripe’. Bread Machines- use ½ tsp Instant yeast (or ¾ tsp Active Dry yeast) per cup of flour in your recipe. Visit our Lessons in Yeast & Baking for more information. To keep buns tender and fresh, do not pull apart until ready to use. Tried this recipe a few times using a bread machine. Overall, the rolls are quite tasty. My minor changes are simply to heat the liquids to about 100 degrees before mixing in the dry ingredients. And bake for at least 14 minutes. My oven is pretty accurate and 10-12 minutes is definitely not enough time. Also, the rise time will vary quite a bit depending on air temperature.